A 2009 study by the National AIDS Control Committee (NACC) with support from the US Government, projected more than 50,000 new cases of HIV/AIDS and 560,000 people living with HIV/AIDS in 2010 and an estimated 620,000 cases by 2015 in Cameroon. There was limited access to quality essential medicines, including antiretrovirals (ARVs). 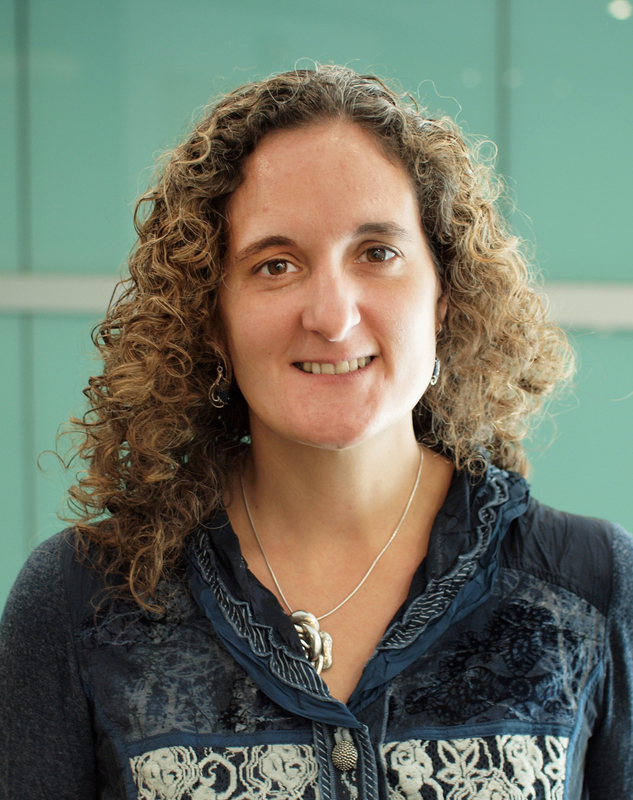 Inadequate staffing, poor management of HIV commodities, and limited funding contributed to limited access to treatment for people living with HIV/AIDS. In 2011, the USAID West Africa Regional Office funded SIAPS to undertake a situation and option analysis of pharmaceutical management in Cameroon. The analysis concluded that stocks-outs were the result of systemic dysfunctions at all levels, and there were no data to measure the magnitude of the problem or ensure an efficient supply chain. Major contributing factors included the lack of funds to procure and distribute HIV commodities and limited forecasting and quantification capacity. 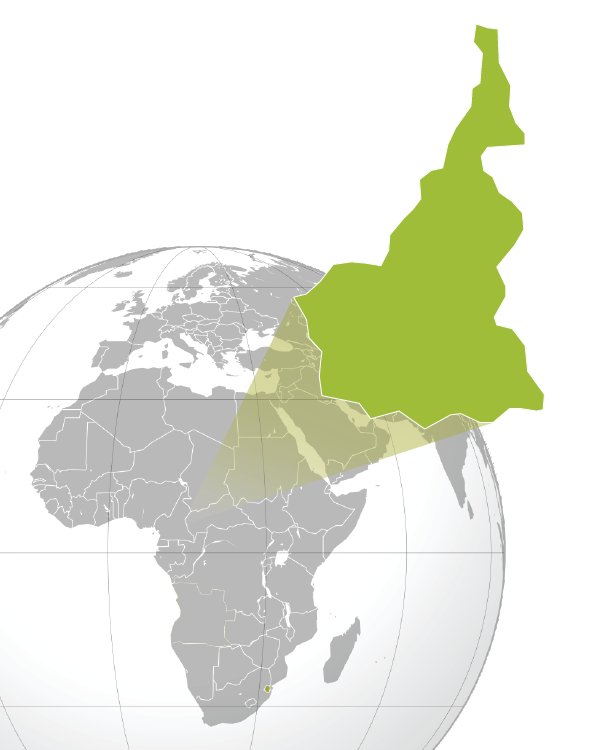 SIAPS started work in Cameroon in 2012 with funding from the US President’s Emergency Plan for AIDS Relief (PEPFAR). The goal was to ensure availability of HIV commodities at all levels. During the project, USAID provided USD 6 million – over four years. Technical assistance gradually moved from the national level to regional and health facility levels. SIAPS addressed various components of the pharmaceutical system. Project activities were implemented in collaboration with government counterparts, international partners, other PEPFAR implementing agencies, and national associations. Interventions provided an immediate response to urgent pharmaceutical problems, developed the policy framework, and built human resource capacity to strengthen the health system. – Institutional Governance and compliance with donor requirements: To increase the availability of ARVs at the national level, SIAPS supported the NACC to prepare Global Fund documents related to Round 10 extensions by developing the Report on Quantification of Needs for HIV/AIDS Commodities. – Building capacity and governance: At the regional level and at antiretroviral therapy (ART) sites, technical advisors helped strengthen coordination among HIV program managers and medical stores to improve regional distribution plans for HIV commodities. Technical advisors also developed and implemented a continuous quality improvement process to empower health facility managers to lead HIV clinic teams, interpret pharmaceutical indicators, and use supervision tools to address constraints. – Accuracy, availability, and use of data: SIAPS and other partners printed and disseminated forms, standard operating procedures (SOPs), and guidelines and implemented a training and supervision strategy to ensure the accuracy and timeliness of HIV data and reports. – Storage and distribution of HIV products: Technical assistance on the procurement and storage of ARVs included the provision of essential equipment (e.g., shelving, inventory cards) and training. – Medicine storage: SIAPS improved storage conditions and inventory management. 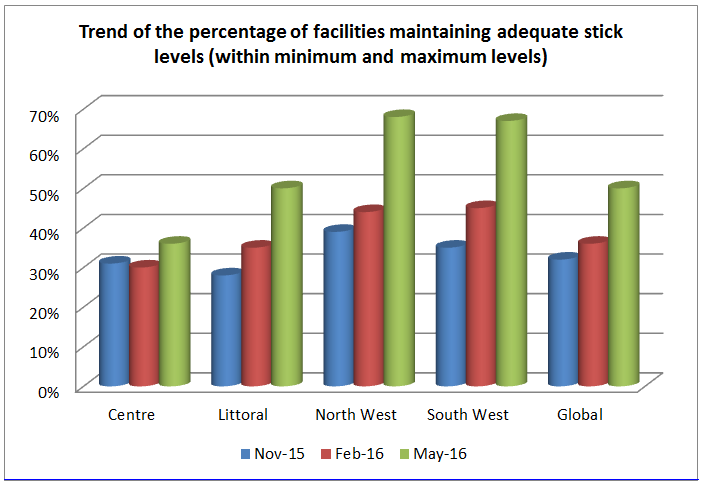 In the North West and South West regions, the number of facilities maintaining adequate stock of ARVs increased by 29% and 32% respectively. The physical stock percentage increased by 66%. At the peripheral level, SIAPS monitored storage conditions using the minimum requirements set for regional warehouses and ART sites. – Pharmaceutical and patient data Improvements: Prior to 2012, the HIV program in Cameroon lacked a system to capture patient and pharmaceutical information. With support from SIAPS, The availability, quality, and use of data at 129 ART and prevention of mother-to-child transmission (PMTCT) sites improved. By December 2015, 63% of facilities were reporting on time and with complete reports, and 87% had complete patient information. 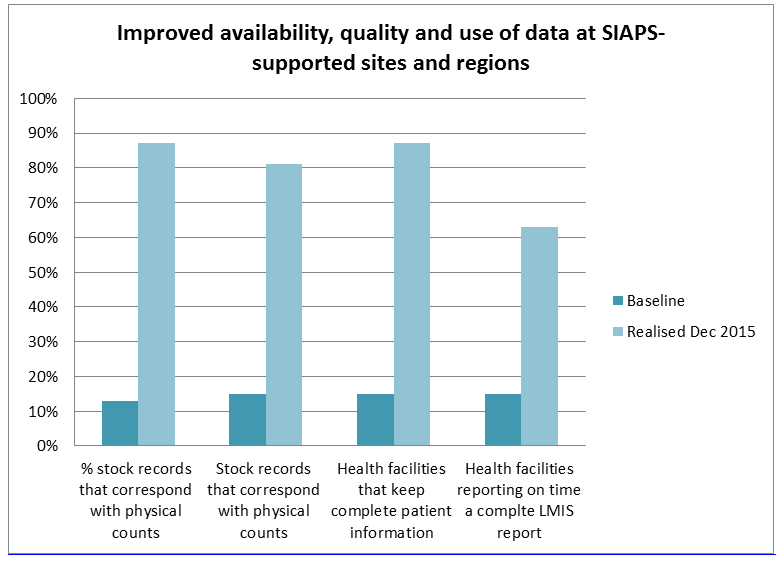 Among SIAPS-supported health facilities, 98% collect complete patient information (September 2016); 79% monitor and maintain suitable stock levels of ARVs (June 2016), compared to 15% in 2013; more than 82% report monthly logistics information (September 2016); and the HIV pharmaceutical management information dashboard has complete information (98%) for ART sites in the four PEPFAR-supported regions (June 2016), resulting in better coordination of pharmaceutical services between government and development partners, minimizing duplication of efforts, and enhancing the accuracy of ARV quantification and forecasting. – Human resource capacity: Most improvements in human capacity to manage HIV commodities and oversee pharmacy services were attributed to the implementation of a continuous quality improvement methodology and key SOPs. SIAPS facilitated the transfer of leadership for HIV commodity management from the national HIV program to regional HIV coordinators. SIAPS collaborated with a local civil society organization to leverage advocacy, monitoring, and reporting efforts to improve transparency, accountability, and patients’ access to HIV commodities. As of June 2016, ART site coordinators at 69% of health facilities were conducting regular internal supervision of pharmaceutical services, verifying stock levels, and ensuring consistency of reported data. – Stock-outs and Availability of Medicines: At SIAPS-supported health facilities, stock-outs of ARVs decreased significantly, from 100% of facilities reporting a stock-out in 2014 to 9% in 2016. By meeting Global Fund conditions, the NACC enhanced coordination of donor-supported activities, which in turn contributed to reducing disbursement delays and enhancing the timely availability of ARVs. Forecasting and quantification also improved and reduced stock-outs of the most widely used ARVs. Through interventions at all levels, the availability of ARVs improved significantly and met Global Fund conditions. Enhanced availability of ARVs will contribute to the NACC’s goal of universal access to ARVs and reduced mortality and morbidity. 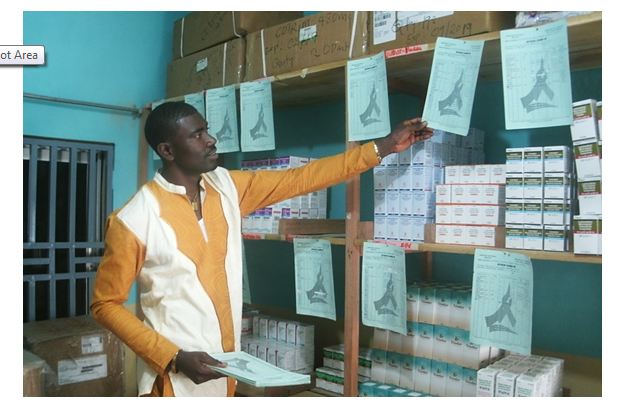 SIAPS has played a crucial role in enhancing the coordination and management of pharmaceuticals at the national and facility levels, which has reduced stock-outs in Cameroon. Users throughout the health system have increased access to information to generate reports for decision making. These interventions contributed to a 91% reduction in stock-outs and successful integration of the HIV program into the general pharmaceutical management system. SIAPS has raised awareness of the need to improve governance and information systems in the pharmaceutical sector in Cameroon. However, Cameroon’s pharmaceutical system remains fragile. Access to pharmaceuticals and services will continue to require reforms in institutional governance, procurement, and information management at the point of care. These reforms will require significant financial investment, technical assistance, and high-level political commitment. 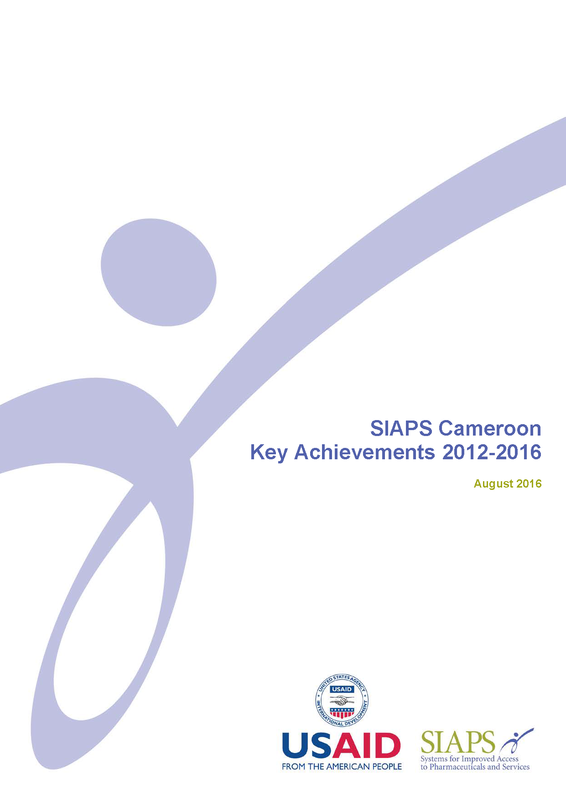 SIAPS-Cameroon closed in September 2016 and held a closing ceremony on August 25, 2016 to highlight the project’s achievements and lessons learned in building resilient pharmaceutical services.